There is nothing that can compare to a freshly baked peanut butter cookie. Crunchy outside with a chewy center, these cookies will melt in your mouth. 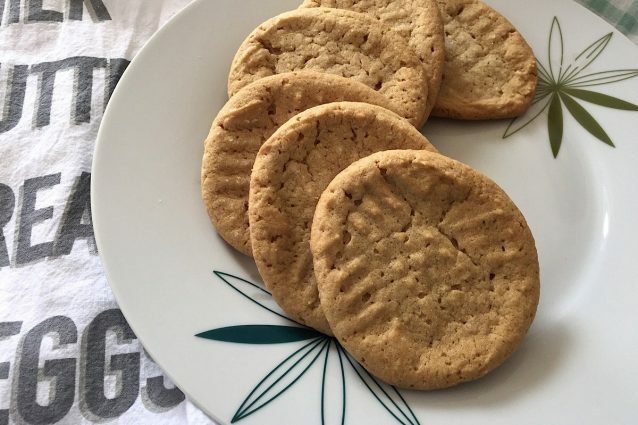 While this recipe calls for creamy peanut butter, feel free to use crunchy if you like a few peanut pieces in your cookie. In a stand mixer with a paddle attachment, cream the butter, peanut butter and brown sugar together until light and fluffy. Scrape down the sides of the bowl and mix again to ensure everything is fully mixed in. Add the eggs and vanilla extract to the bowl and mix, scraping down the bowl again as needed. Add the remaining dry ingredients to the batter and mix just to combine. Scoop the cookie dough onto a foil or parchment lined sheet tray. Space the cookies about 2 inches apart as they will spread when baking. Use a fork dipped in sugar to press a crisscross pattern into the cookies. If the fork is sticking to the cookie batter, sprinkle the sugar directly on to the cookie and then press the fork down. Bake the cookies in a 350 ̊F oven and bake for 12-14 minutes. The cookies should just be brown on the edges and still look slightly soft in the center. Allow to cool on the sheet tray and then enjoy! – Add 1 cup chocolate chips for an amazing peanut butter chocolate cookie. -Make small, bite sized cookies by scooping the cookie dough into smaller balls. They will be even easier to pop into your mouth this way!